Discover the benefits of zero clearance fireplace. If you’ve been wondering what is the best fire feature to add to your home, then a zero-clearance fireplace would be an excellent option. These low-maintenance features don’t require you to change anything about your home and work perfectly in small spaces. They’re just what you’ve been looking for to add ambiance, warmth, and enhanced comfort to your home. Zero clearance fireplaces can be easily installed in any home. They are pre-fabricated inside a factory and then brought to your home, so the installation time is quick and won’t disrupt your day. It’s recommended that, while many homeowners are handy, a professional should do the installation for you to ensure that it is properly placed and fully operational. Since they have been pre-fabricated, costs are also lower with these types of fireplaces as they take less time to install and don’t require concrete foundations. While masonry fireplaces often require regular masonry and chimney maintenance, zero clearance fireplaces are much more convenient to own. Zero-clearance fireplaces are also simple to operate. In terms of efficiency, they up to 60% more efficient than masonry fireplaces. Offering plenty of versatility, you’ll have the choice of using gas or wood to fuel your zero-clearance fireplace. Depending on the size of your home, there are also different sizes and styles that you can choose from to complement the layout and design of your home. 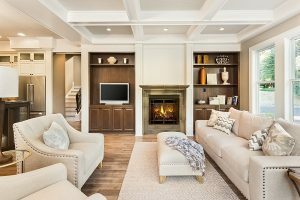 A professional will help you pick the right size for your space, to maximize that area in your home to create the perfect look and offer enough warmth for the area. Once it’s been installed, you’ll immediately notice the change in the atmosphere of your home as it offers a cozy and more welcoming experience. Zero-clearance fireplaces are the perfect addition to small spaces. If you’ve always wanted a fire feature but didn’t think that your home was big enough, this option is the perfect solution as it doesn’t require a buffer zone between other appliances or other flammable materials. This entry was posted on Friday, November 10th, 2017 at 2:28 pm. Both comments and pings are currently closed.